NOW LEASING LAurEN StILLEy VIcE PrESIdENt LEASING 310.665.9650 L.StILLEy@fEStIVALcOS.cOm mAkING A NEW PLAcE fOr dINING ANd ENtErtAINmENt RETAIL CONSULTANT MANAGEMENT LEASING OWNER HHLA: A seamlessly connected mix of entertainment, restaurants, and retail. 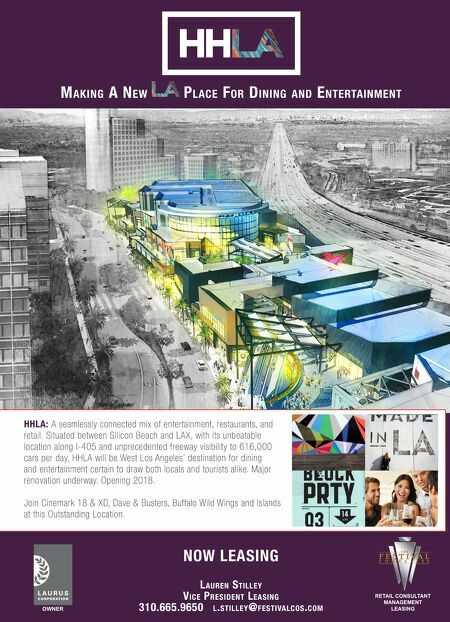 Situated between Silicon Beach and LAX, with its unbeatable location along I-405 and unprecedented freeway visibility to 616,000 cars per day, HHLA will be West Los Angeles' destination for dining and entertainment certain to draw both locals and tourists alike. Major renovation underway. Opening 2018. Join Cinemark 18 & XD, Dave & Busters, Buffalo Wild Wings and Islands at this Outstanding Location.